Sony has unveiled the new S2 tablet with two 5.5-inch displays, offering Android 3.0 in a clamshell design. 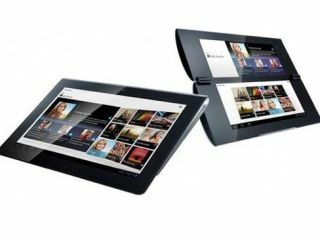 It's a bold statement from Sony, with the two screens able to operate together or independently for video, web browsing or email – plus the option to have one screen dedicated to controls. The S2 will be able to 'throw' content via DLNA to a TV or wireless speakers, and access the PlayStation Network (should it ever decide to become available to the public again). Qriocity will also be a central part of the S2 tablet, with music and video available on demand, although we're awaiting confirmation that the UK will be getting the full range of services as it's badged differently on our fair shores. The S2 will also be able to connect to the PlayStation Suite, giving access to a number of first generation PSOne titles to 'enjoy'. Sony hasn't given anything away about the specs as yet, but early rumours (which nailed the codenames and screen sizes) tipped the tablets to pack Tegra 2 dual-core processors and, rear-facing cameras and 3G connectivity. Worryingly, the same source also called the S2 tablet 'a dog' of a project, with a price tag of around £500. The S2 has a UK release date of 'autumn 2011' so we'll probably be hearing a lot more from this over the coming months.